Will It Take Dead Bodies? This morning Oklahoma was hit by a 5.8 magnitude earthquake with the epicenter near Pawnee, Oklahoma. The damage is still being assessed, but there is significant damage to the town’s historic buildings and more damage reports are sure to come in from the surrounding area. The earthquake was felt by persons in numerous states throughout the Midwest. It is the largest earthquake in Oklahoma history, eclipsing the previous record of 5.7 set in 2011, and it was the second magnitude 5+ earthquake in Oklahoma this year (the first year in Oklahoma’s history to record two magnitude 5+ earthquakes). Oklahoma has experienced thousands of earthquakes over the past 6 years since the fracking boom in Oklahoma has led to massive amounts of wastewater being stored in injection wells throughout the state. In spite of the fossil fuel industry using its clout with Oklahoma’s government and higher education to attempt to misinform the public about the correlation between wastewater injection wells and earthquakes, numerous independent scientific studies have shown that the evidence of correlation is overwhelming. 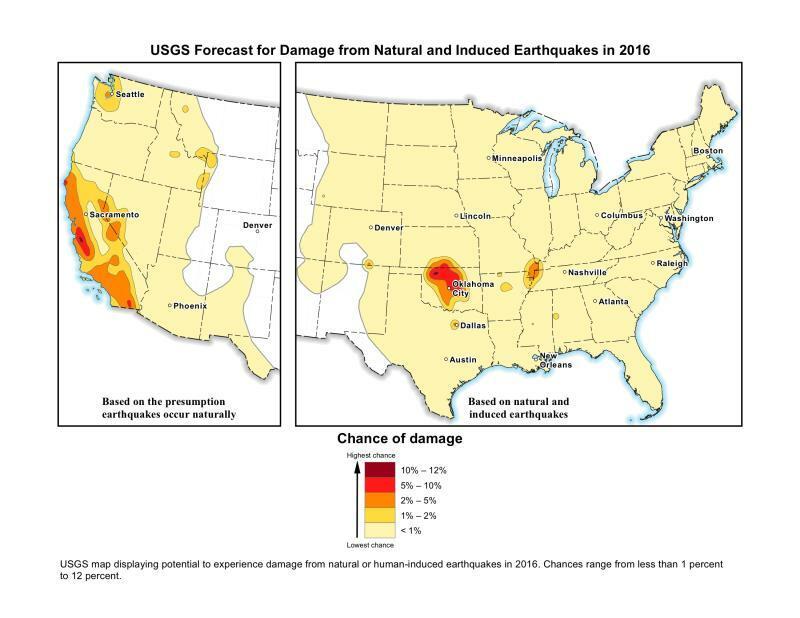 The United States Geological Survey had to redraw the nation’s earthquake hazard map to indicate that chances of a damaging earthquake are now just as high in Oklahoma as they are in California. Today highlighted the prescience of the USGS’s map revision. Almost any other state in the United States would put a total moratorium on fossil fuel industry wastewater injection if it experienced the kind of fossil fuel industry induced earthquakes that we experience in Oklahoma – but not Oklahoma. We have become a commodity colony in which the well being of our citizens is less important than fossil fuel industry profits. In a just nation, the federal government would come in and do a thorough assessment of the damage caused by the earthquake this morning in Oklahoma and give the bill to the fossil fuel industry for payment. The injustice of private citizens paying insurance premiums and deductibles for damage caused by the fossil fuel industry is criminal. People: Something has to be done now to stop these earthquakes!! Oklahoma Government: We are doing everything we can to study the situation. We are not yet sure about the cause of this particular earthquake, but after a careful assessment we will make public our course of action. People: You better! We are mad as hell, and we are not going to take it anymore! Oklahoma Government: After careful assessment we have decided to lower the amount of wastewater being injected into certain areas of concern. People: We would feel better about a moratorium. Moratorium now! Oklahoma Government: We can’t shut down wastewater injection in Oklahoma. It will hurt the fossil fuel industry too much. We know what’s best. In the meantime, we recommend you buy earthquake insurance. People: Well this better work! Oklahoma Government: We are happy to report that we are having fewer earthquakes owing to the responsible action we have taken to manage wastewater injection. People: We feel a little better and will be quiet for a while. Another Big Earthquake hits Oklahoma – Wash, Rinse, Repeat. This cycle will never change unless the people make it change. In the meantime, federal government could you please help protect us from ourselves before the damage caused by the fossil fuel industry in Oklahoma is measured in bodies, not just falling stones and bricks? Will it take dead bodies for Oklahoma to address this crisis? Will dead bodies even be enough?